By comparing the factors in two DISC profiles, we can explore and explain the dynamics of a relationship between two personalities. A DISC relationship assessment is created by directly comparing the DISC factors in one personality profile with the factors in another. The ways in which these factors match up with one another, or show significant differences, give us a basis for understanding how two personalities will relate to one another. Relationship assessment is based on the concept of DISC dynamics, connections between different factors in two different personalities. For example, when two independent High-D's work together, there'll be a competitive element in the relationship, while High-D working with a patient, steady High-S will introduce in a quite different relationship dynamic. When we compare two complete personality profiles, the result is a network of dynamics that give us a rounded picture of the working relationship, at least in personality terms. See how two DISC personality styles compare, at a glance. The relationship report looks in detail at the dynamics driving any working relationship. Discus looks at the relationship from both perspectives, describing alternative viewpoints. Often a relationship can appear quite differently to each of the two people involved, and for that reason a Discus relationship assessment is always made up from two parts, explaining the relationship from each person's own point of view. Depending on the profiles involved, these perspectives can be quite similar to one another, or they can be remarkably different. Using this approach of understanding a relationship from both perspectives is what makes a relationship assessment so useful. Being able to see where expectations and motivations differ means that we can anticipate or defuse conflicts within the relationship. Not only that, but we can use a relationship assessment to judge the likely compatibility of individuals who may not even have met, and so use relationship assessment to build effective partnerships and develop truly effective teams. For any combination of two candidates from your database, Discus will create a relationship assessment describing the dynamics within their working relationship, from the perspective of each individual. Relationship Assessment in Summary: By comparing the DISC profiles of two different people, we can build a picture of the ways that those two people will interact with one another. 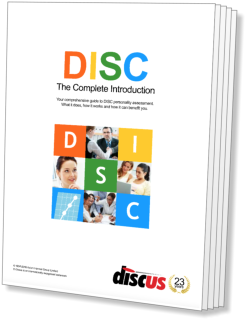 DISC Dynamics: The connections between different DISC factors on different DISC profiles define a set of DISC dynamics, and they form the basis of the Discus relationship assessment. Different Perspectives: Each relationship assessment comprises a pair of mirrored results: the relationship as viewed from the perspective of each of the two people involved. Free and Unlimited: Relationship Assessment is a free and unlimited part of the Discus service. Registered Discus users can analyse the relationship between any pair of DISC profiles without restriction. See a Sample Report: Take a look at how Discus can assess relationships for yourself with our sample Discus Relationship Assessment.